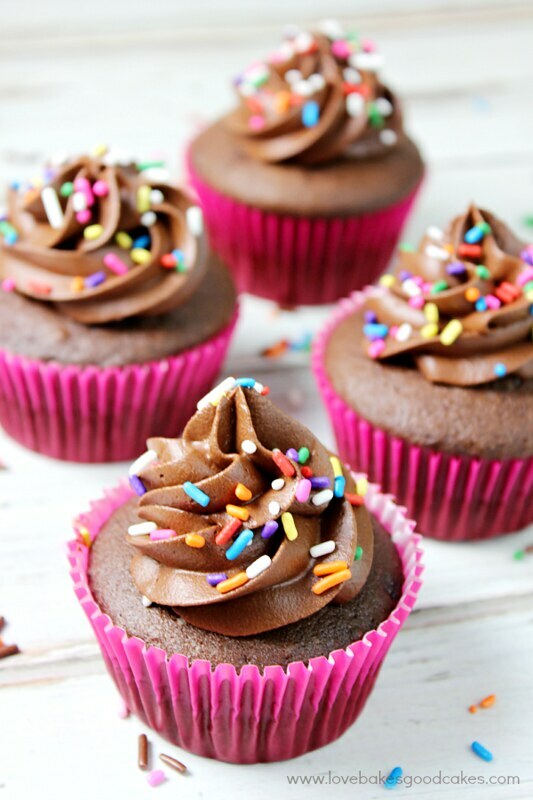 These From Scratch Chocolate Cupcakes with Chocolate Frosting are perfect for celebrating! 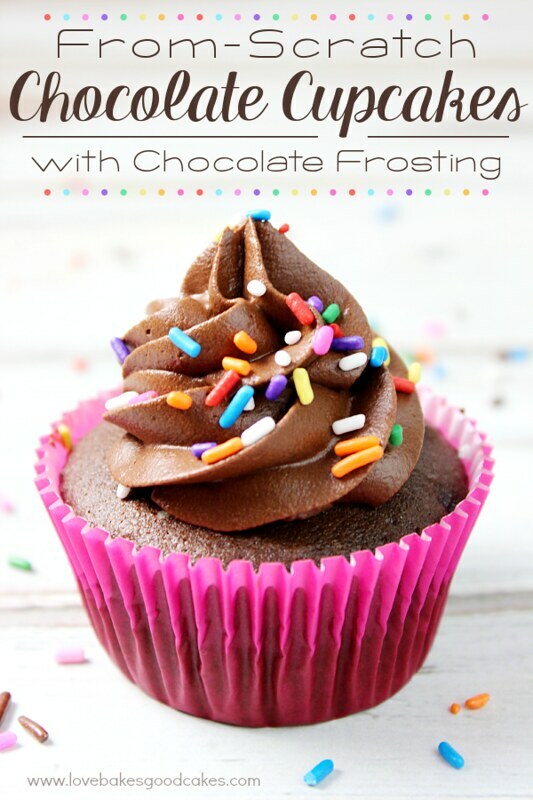 Full of chocolate flavor – they just may become your favorite cupcake too! 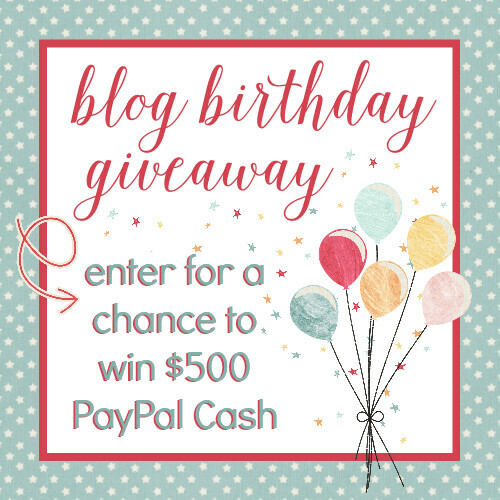 Plus, a Blog Birthday Giveaway – enter for a chance to win $500 PayPal Cash! Hey friends! I am so excited to have you join me and a few of my blogging friends as we celebrate a few blogging birthdays! I don’t know about you, but at the Love Bakes Good Cakes house, birthdays are always filled with our favorite meal and the birthday girl or boy gets to pick their favorite dessert! I think blog birthdays should be just as much fun – which is why we’re sharing all of these awesome treats! Seriously, read all the way to the end for sugar overload! 🙂 Love Bakes Good will be 3 years old on February 27th …. It has been a wild ride. This little ol’ blog has turned into something much bigger than I ever imagined. I am grateful for my readers (you’re the reason I do what I do!) and my online friends who have turned into real life friends. 1. Heat oven to 350°F. Line muffin pans with paper cups. Set aside. 2. In a large bowl, stir together sugar, flour, cocoa, baking powder, baking soda and salt. Add eggs, milk, oil and vanilla; beat on medium speed with an electric mixer for 2 minutes. Stir in boiling water (batter will be thin). Fill cups about 2/3 full with batter. 3. Bake 22 to 25 minutes or until wooden pick inserted in center comes out clean. 4. Cool 10 minutes; remove from pans to wire racks. Cool completely. Melt the butter. Whisk in the cocoa. Alternately add powdered sugar and milk, beating to spreading consistency. Add small amount additional milk, if needed. Stir in vanilla. 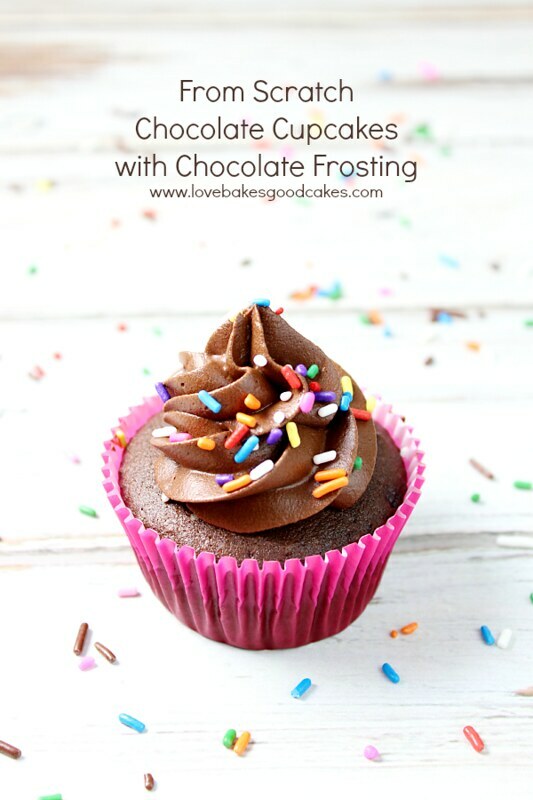 Spread or pipe frosting over the top of cooled cupcakes. Top with sprinkles, if desired. 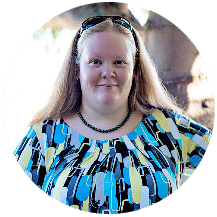 Meet the bloggers helping me celebrate … a few of them are celebrating their own blog birthdays too … they’re all wonderful ladies with great blogs, so be sure to stop by and check them all out! « 40 Easy & Delicious Quiche Recipes! Cheesecake! Though I am really happy with just about anything. I am not too picky! Jamie, those cupcakes sound SO good! Happy birthday, my friend! So happy to be celebrating with you and sending you lots of hugs and happy wishes! I like ice cream cake on my birthday! 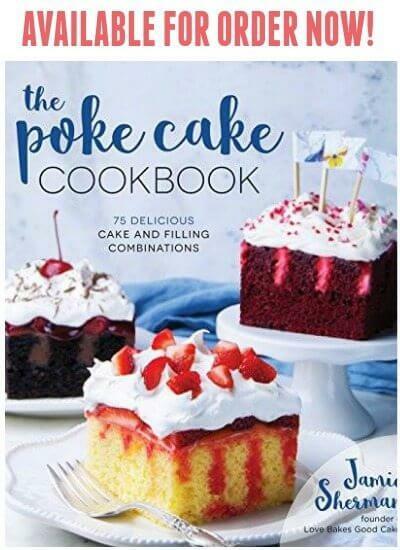 posting as theresa krier , i love a cherry cake with 7 minute frosting, yum ! My favorite birthday treat is chocolate pie. I love these cupcakes. They look so yummy! My mom's German cheesecake done turtle style! Anything chocolate! These cupcakes look awesome! Great giveaway and those cupcakes look delicious! I'll have to try the recipe and take advantage of the giveaway. Chocolate on chocolate WITH sprinkles? You CAN'T go wrong with that. Ever. I love any kind of dessert to celebrate a birthday, really. Or, even when there is no birthday. I just have a major sweet tooth! These cupcakes look so so delicious! Happy Blog Birthday!!! Pink Lemonade cake is my favorite for my birthday! 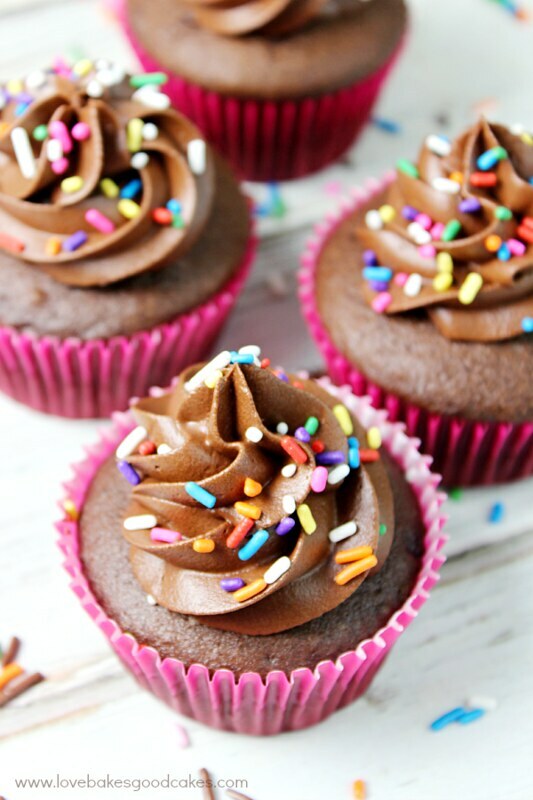 Yummy – chocolate is my absolute favorite and these cupcakes look fantastic! These look absolutely amazing! I love the sprinkles! Congrats on your 3 years!! Great giveaway and those cupcakes look amazing! Those cupcakes are gorgeous & happy bloggerversary! Happy Bloggerversary! I love "from scratch" recipes! These cupcakes look picture-perfect! Thanks so much for inviting me to celebrate with you!! And HAPPY, HAPPY ANNIVERSARY!! Congratulations on 3 years! <3 It's a toss between Carrot Cake and Lemon Sour Cream Pound Cake! This looks so amazing! So good! Wow, 3 years – congrats!! And that cupcake looks amazing!! I'm not sure if my first comment went through, but if it didn't. Congratulations and Happy Birthday! My favorite birthday dessert is pie. Preferably a fruit pie. I have been known to also eat cheesecake or tiramisu as my birthday dessert. I just love your Chocolate Cupcakes. Hope you are having a great week and thanks so much for sharing your post with Full Plate Thursday. These cupcakes look amazing! I'm a sucker for chocolate cupcakes with sprinkles! Congrats on your bloggy birthday! Thanks so much for sharing at my Creative Ways Link Party. I hope you'll be back again this week!